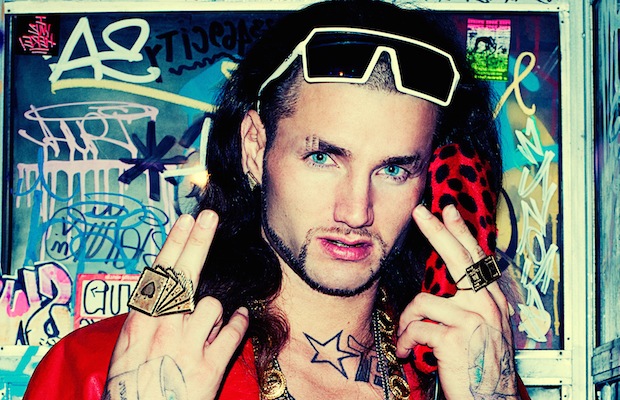 Riff Raff Premieres “Tip Toe Wing in My Jawwdanz” Music Video | Catch Him Nov. 22 at Anthem! Love him or hate him, there’s no denying that Texas rapper Riff Raff, a.k.a. Jody Highroller, is one of a kind. The self-proclaimed “neon icon” (also the name of his latest album) has been amassing an underground following for the last several years, and rose to further mainstream recognition when he famously (or controversially) served as the inspiration for James Franco’s character in 2013 Harmony Korine film Spring Breakers. With a killer new album, elevated presence, and co-signs from many of his peers, there’s never been a better time to jump onto the Riff Raff bandwagon, and the ’90s loving, codeine sipping MC’s latest, an ode to J’s called “Tip Toe Wing in My Jawwdanz,” is a perfect jumping off point. The just-released music video for the track features a whole plethora of cameos, from actors to rappers to internet stars, and pretty much perfectly sums up the weird sensibilities of Riff Raff. Check out “Tip Toe Wing in My Jawwdanz” below, and grab tickets to see the rapper live Nov. 22 at Anthem with Herobust and Manic Focus if you want to see what all the fuss is about for yourself. We highly recommend it.